PMMA microspheres are PMMA particles with spherical morphology. Poly(methyl methacrylate) /(PMMA, also known as acrylic or acrylic glass. It is a transparent thermoplastic often used in sheet form as a lightweight or shatter-resistant alternative to glass. It can be used as injectable dermal filler material for Artefill, Metacrill used in plastic surgery. Because of its good flow ability, easy to disperse in organic solvents and heat and weathering resistance. Industrial grade PMMA as light diffusion agent used in astigmatic shade, LCD light diffusing plate, film, LED light diffusing lampshade. PMMA as matting agent for plastic film, sheet metal and paint. PMMA as anti-inhibitors for sheet metal. As anti-adhesive agent for plastic film [opening agent]. PMMA microspheres as cosmetic additives to improve light-scattering properties, smearing sense, and smoothness. Used as paint, rubber additives in order to improve abrasion resistance, water resistance. Used as modified plastics additives. 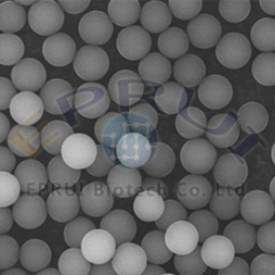 EPRUI accepts customization for special particle size.